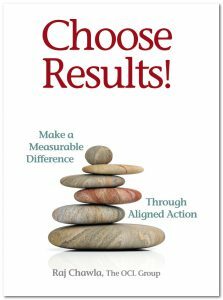 Choose Results is a deeply considered “call to action” to leaders who are committed to improving the well being of people. Grounded in the well-sourced fields of action learning, collaborative thinking, and collective action, Choose Results elucidates in close detail the necessary but difficult task of collaborating with others in ways that align action, de-emphasize the personal, and leverage parallel lines of work. With an emphasis on application and implementation, this book provides methods, worksheets, and templates to give leaders the tools and practices they need to work effectively with multiple stakeholders and partners, and choose results in spite of beaucracy, personality, or competing priorities. 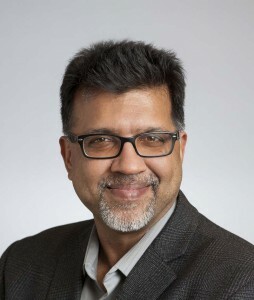 Over the last twenty years, Raj Chawla has worked with hundreds of leaders who are interested in making a measurable difference in the quality of life of the people in their communities. With a focus on practice and application, he connects leaders’ inherent passion for making a difference to the discipline of using data to inform decisions and the sometimes humbling vulnerability needed to engage in the new learning that is required to choose results. WHAT PEOPLE ARE SAYING ABOUT CHOOSE RESULTS! Click here to purchase the book on Lulu! Human intelligence is a rich and complex amalgam of inputs, which include innate abilities; “book learning” gained in schools and elsewhere; and influences from family, mentors, coaches, and teachers. These inputs are key, and vary depending on the individual and his or her circumstances. What is even more variable among individuals—but of the utmost importance to developing one’s unique intelligence—is experience. Experience allows humans to build on the various inputs they’ve received and to engage in the most powerful type of learning: trial and error. In many ways, this book is a call for leaders—regardless of role and position—to use their intelligence and experience to work with others to make progress toward population-level results, in other words truly significant and meaningful progress. This book on results leadership is the manifestation of my process of building my own intelligence in just this way. I’ve been fortunate to encounter many frameworks and mental models that form the basis of results leadership as I know and practice it; to engage with teachers, mentors, and coaches who have helped me integrate and apply my new knowledge in various ways; and, perhaps most importantly, to have been offered numerous opportunities to implement results leadership, including my full share of trial and error, integration, and learning. While it takes strong leaders and a powerful commitment to achieve results, one underlying component of most successful projects is a solid “container” to support the work. In results based leadership, the “container to achieve results” is created from project launch through completion and includes features that create buy-in and a shared commitment to results. 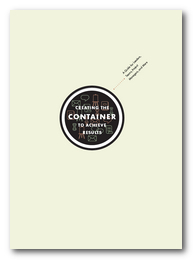 This booklet provides an overview of the phases involved in creating a container for results, plus the detailed checklists and narrative needed to get it all done. An indispensable guide for leaders, teams, project managers, and anyone else leading an effort to achieve results in areas that matter. When you’re in your leadership role, sometimes it’s hard to know what to do and how to have the most impact. In fact, traditional models for leading don’t include all the skills that leaders need for maximizing their effectiveness. That’s where coaching tools come in: strategies to help others find better and more effective ways of carrying out their roles in the workplace by gaining access to new ways of thinking and seeing. 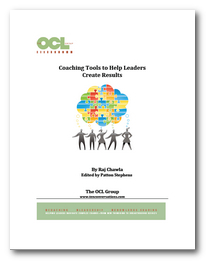 “Coaching Tools to Help Leaders Create Results” not only equips leaders with new ways of thinking and seeing, but it does so in the context of meeting organizational results that matter and to which each person is accountable. This context uniquely drives home the content which, as a welcome change, is a breath of fresh air in the field of leadership development.